Jacob started playing guitar at the young age of ten years old. He was inspired by his favorite band KISS to pickup the instrument after seeing them live. He loved the idea of getting on a stage and providing this unbelievable experience for the fans. He wanted to offer the same experience for his friends and family. He then decided to get some lessons, and after a short time, his teacher noticed a hobby could end up becoming a potential career. Jacob started playing with local bands at the age of twelve. He filled in for many groups, playing a wide variety of genres including blues, country, jazz and pop. He started his own band called Stay Tuned with his twin brother (singer) that covered 80’s rock music. The band did many shows, and even released an EP of original glam metal music. Stay Tuned had a great run and it was due to the fact that they offered an unforgettable experience that inspired Jacob in the beginning. Jacob has stood on stage with some of the best including Steel Panther, Reed Robertson (Duck Dynasty), Rudy Sarzo (Ozzy Osbourne/ Quiet Riot) Brian Tichy (Whitesnake, Billy Idol, Ozzy Osbourne) Blas Elias(Slaugter/Trans Siberian Orchestra) Chas West (The Mobey Dicks), Great White, Carmine Rojas (Joe Bonamassa/David Bowie), Greg Douglass (Steve Miller Band), Alvin Taylor (Jimi Hendrix), Harold Brown (War), Ashes (Devil Driver/Static X), Chris Reeve (Filter), and more. Jacob is currently twenty years old and serves on the worship team at Active Church in Yucaipa, CA plays Lead Guitar for NBC’s America’s Got Talent, and Country Artist James Rensink. Jacob also has his own YouTube channel as well. 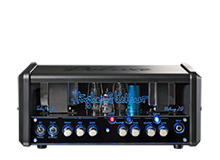 He is a proud user of the amazing Hughes & Kettner amplifiers.